Photographed at the Laguna Seca Ranch in South Texas Januay 29, 2019. Nikon D850, Nikon 300mm f/2.8 lens, Nikon 1.4 TC, 1/2000 sec at f/5.0, ISO 2500. Usually would not push the ISO this high on an 850, but the Sun was setting and the light looked pretty nice. Well done, Gene! Great capture of this pair in facing poses. The background, as usual, is brilliant. Great to have them in the frame. Unique perch and nice background. 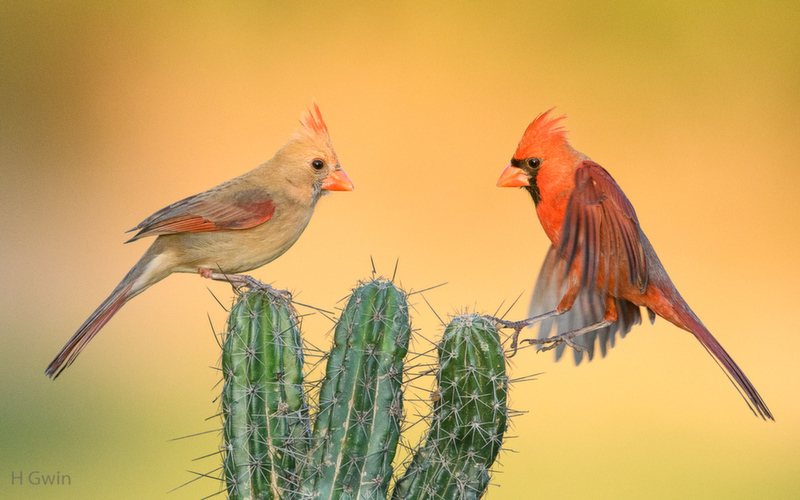 Beautiful capture with the pair facing each other on their cactus perch, Gene! Very cool image! Not a native Texas cactus, right? Cool shot Gene, lovely background and perch! Joe, This is an extremely rare native Texas cactus. It is a night blooming cactus that only blooms one night a year. Of all native cactus in Texas, this may be the most native--if being the most native is possible. Thanks for the info, Gene. Gorgeous pair on a prickly perch. Not where I expect to see cardinals. The light is exceptional. Such beautiful light Gene. Glad you pushed it! Stunning frame of this pair . Great work. Wow. Great . . . everything! Outstanding image Gene, that is a real beauty.